Lost Body of Mother Discovered Because of Her Daughter's Dream! With the help of a dream, a young woman discovered the tragic fate of her mother. The Taiwanese husband killed his wife and cut the body into pieces. He then hid his wife’s body in the different parts of their home in Makati. Athena Imperial reported on GMA News Balitanghali that around 9:00PM last Tuesday, body pieces of the victim were found in the 3rd level of their house in Pio del Pilar Makati. In an exclusive interview, the daughter searched her mother to the Taiwanese father, but the latter insists that her mother left the house without giving any notice. While sleeping, the daughter dreamt her mother was in the stockroom of their house and pleading for help. Together with her brother, they went to the stockroom, but unfortunately the Taiwanese husband was there busy doing some stuff. When they got the chance to check the stock room they immediately smell the foul odor and they were shocked by seeing the body of their mother in pieces. They asked the police for help instantly. Police authority together with the victim’s relative is still looking for the other parts of the body. 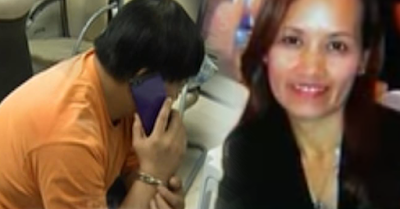 The Taiwanese husband named Kuo is now in Makati Police Headquarters and facing a case of Parricide. Reason of killing is still unknown and authorities are still investigating the incident.